After the hunt, use the hide as well as the meat. Take your hunting to the next level and tan the deer hides after cutting up the meat. 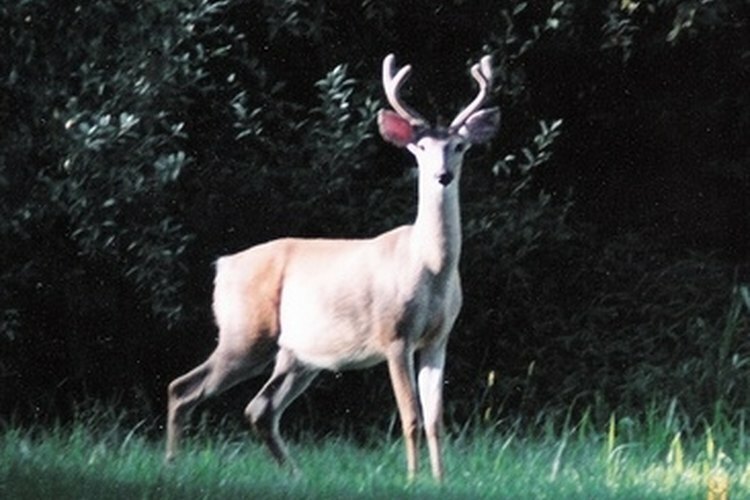 Deer hides are used to make leather jackets or boots or as wall decor. If you are just learning tanning and taxidermy, use this easy method of tanning the hide, which combines salts and alum to bring the hide to a tanned and preserved state. Strip away all sinew, meat and tissue from the back of the hide using the back end of a knife or the edge of a piece of timber. Take the time to remove all chunks of fat and flesh. Cover the back of the hide- -- the non-hair side -- with a generous coating of non-iodized salt. Leave the hide outside until it is dry. Fill the garbage can with water and soak the hide in the can for eight to 10 hours. Change the water every two or three hours. Remove the hide from the water and drag the backside across the edge of the timber. Take care not to scrape so much that the hair roots are exposed. Pour four gallons of water into the garbage can and dissolve 2 1/2 pounds of salt in the water. Add one pound of ammonium alum in the small bucket and add one gallon of water; stir until the alum is dissolved. Pour the alum-water mixture into the garbage can with the salt water and then put the hide into the solution. Leave it in the solution for four days. After four days, remove the hide and rinse with fresh water from a garden hose. Hang the hide over the clothesline, or nail it to a piece of plywood, hair side down. Place it in a dry and dark area such as a basement until partially dry. Combine 3 1/2 ounces of the Neat's feet-oil, 3 1/2 ounces of warm water and 1 ounce of ammonia in a small bucket and brush the solution onto the back of the hide. Let it stand for an hour and then add one more coat. Cover the hide with plastic sheeting overnight. Take the hide down and rub it across the back of the timber or a sawhorse. Add water to the back of the hide with a wet cloth and add a little of the Neat's solution. Once the hide is soft and supple, sand it down to smooth it out with fine sandpaper.